Killing Baron Nashor in League of Legends grants a number of highly valuable rewards that’ll help carry a team to victory. But doing so is risky. Players often have to group together to attack the big scary monster, meaning a clever opponent can easily ambush them. Or worse: steal the kill. Fizz E is a very short jump that allows you to jump again within 0.75s. It’s difficult to consistently nail the jump over the back of Baron/Dragon pit (it’s one of the thickest walls you can consistently jump with Fizz E), even more difficult to time your jump so that you can get in a perfect Smite during that 0.75s to get the last hit on Baron against another jungler with Smite, and on top of that he nails the jump back over the Baron/Dragon pit so he can escape unscathed. What makes it so hard is that you have to get that 0.75s timing perfect: get into pit, get into range, Smite at the exact moment you can kill Baron, and get back out, all in that 0.75s. This particular Baron steal is about as flawless as it gets. 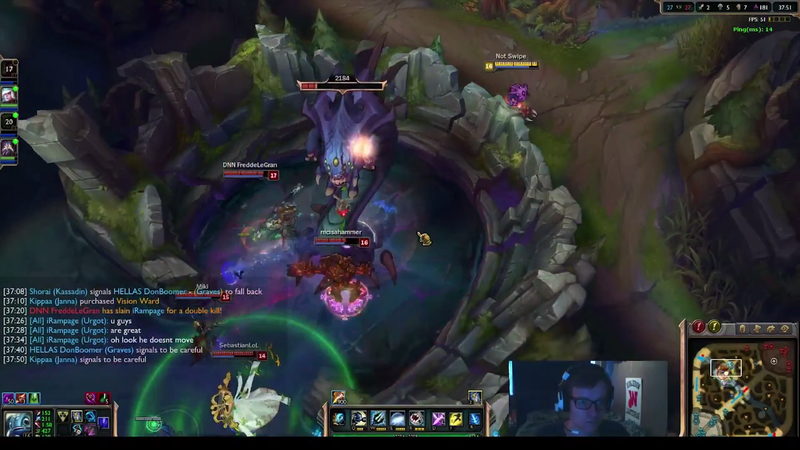 What I’m really wondering is how the other team responded to Fizz suddenly jumping in from over the cliff face behind Baron with the champion’s special jump move, killing the beast, then leaping back out before they even had time to exact revenge on the menacing and deceptively cute jungler. I’m willing to bet that there were some extra calls to “BAN FIZZ” amidst all the raging about how OP his double-jump is after this game ended. UPDATE (3:30 pm): I added an explanation that rad Kotaku reader etaonish was awesome enough to provide in a comment for anyone who’s unfamiliar with the finer details of what’s going on in the video.